OAKLAND, Calif., June 30, 2015 /3BL Media/ - Bulldog Reporter is excited to announce the winners of the first 2015 awards program. 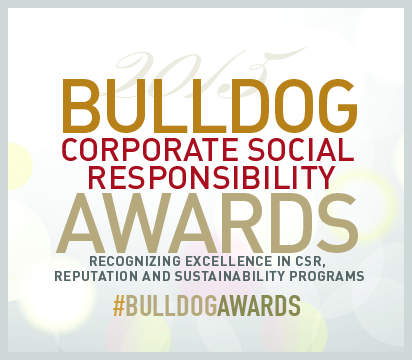 The Bulldog Corporate Social Responsibility PR Awards were launched in 2014 as part of the broader awards program. Bulldog Reporter is thrilled to present 17 awards in this program to a number of deserving companies who have done great things in the area of corporate social responsibility. Winners were chosen exclusively by working journalists from a multitude of submissions with the winners representing the very best in the public relations and communications business. All campaigns were assessed on the basis of their ability to achieve extraordinary visibility and influence opinion, as well as on their creativity, command of media and technology and tenacity. The 2015 Grand Prize for Corporate Social Responsibility Communications Campaign of the Year was awarded to Weber Shandwick for their entry titled World Hunger Relief Pass The Red Cup which was awarded three Silvers in the following categories;Best Cause/Advocacy Campaign, Best Corporate and Community, Non-Profit or NGO Partnership and Best CSR Campaign: Organizations over $5 Billion in Revenue. United Technologies Corporation India Pvt. Ltd.
Bulldog Reporter is the leader in media intelligence supplying news, analysis and high-level training content to public relations and corporate communications professionals with the mission of helping these practitioners achieve superior competitive performance. Bulldog Reporter publishes the industry’s best-read, widest distributed trade journal, Bulldog Reporter’s Daily ’Dog. In addition, the company publishes a daily online newsletter—Inside Health Media—that focuses on media relations, and provides media list and media intelligence services through its Media Pro online directory. Bulldog Reporter also offers complete media monitoring and analysis services. Bulldog Reporter presents industry awards competitions—the Bulldog Awards—which recognize excellence in multiple categories including corporate social responsibility, media relations, digital and social marketing, no-for-profit and overall outstanding professional performance.